Russia and Turkey Make up: What implications for Syria, Kurds? Russian President Vladimir Putin was in Turkey on Monday for direct talks with Turkish President Tayyip Erdogan, in a bid to further normalize relations between the two countries. Russian-Turkish trade and diplomatic ties were stress late last fall when Turkey shot down a Russian fighter jet hitting rebels in Syria, which Turkey maintained had made an incursion into Turkish territory. Turkey is backing the Syrian rebels while Russia is standing behind the Baath regime of Bashar al-Assad. So in fact, Russia had chased Turkmen guerrilla clients of Turkey in Syria’s Latakia province north into the mountains and interfered with the guerrilla plan to take the key Mediterranean port of Latakia. The shoot-down resulted in a trade and tourism freeze from Russia’s side, which deeply harmed some Turkish economic sectors, especially tourism. It also put on hold a Russian company’s plan to build four nuclear reactors to provide Turkish industry with more electricity. Further, a Russian gas pipeline was delayed. Yesterday’s meeting was intended to built on a normalization process that began last summer. Turkey has attempted to keep at least correct relations, including economic relations, with Russia and Iran despite their support for al-Assad in Syria. This approach contrasts with that of Saudi Arabia, which has poisonous relations with Iran in part because their proxies are fighting and killing each other in Syria. Those correct relations were disrupted by the shoot-down. But Erdogan is now blaming that incident on the secretive and cult-like Gulen movement, which he maintains had infiltrated the police, judiciary and military, and which was responsible for the coup attempt in mid-July. Since the failed coup, Turkey appears to have scaled down its ambitions in Syria. It wants to make sure the Syrian Kurds do not create a contiguous territory and declare it independent. The Turkish military went into Jarabulus in Syria to create a Turkish-held pocket for the Free Syrian Army that would prevent the leftist Kurdish YPG from taking that territory and uniting the western Afrin Kurdish canton to those of Kobane and Jazeera. But Turkish efforts to overthrow the regime by, e.g., having its proxies take Latakia, have subsided since this summer’s failed coup. Putin and Erdogan are said to have agreed that civilian humanitarian aid should be allowed to reach the rebel-held East Aleppo pocket. Reuters says that Erdogan said, “We discussed … how we can cooperate on this matter, especially on humanitarian aid to Aleppo, what strategy can we implement so people in Aleppo can find peace . . .” In fact, the Syrian government is besieging and bombing the 250,000 civilians in East Aleppo, and Russia is helping. If Putin’s pledge to Erdogan really is implemented, that is huge. 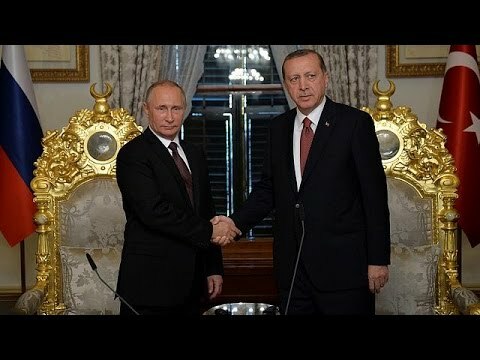 Russian sources suggested (and I would take this with a grain of salt) that Erdogan and Putin had made a secret deal with one another whereby Russia has taken a neutral stance on Turkey’s incursions into Iraq to strike at the separatist PKK Kurdish guerrillas based there, who come over the border to hit Turkish security forces and sometimes to engage in terrorism. In return, Erdogan has ceased regularly demanding that Syrian strongman Bashar al-Assad immediately leave office. If this report has any truth to it, then Turkey may have begun acquiescing in the survival of the Syrian government, which would be huge for the Syrian crisis. “As for Russia, it is not going to interfere with Turkey’s actions against the Kurds at this time, Gazeta.Ru learned from another source, associated with the Turkish direction of the Russian diplomacy. Gazety.Ru’s source noted the Turkish leader’s address at the UN General Assembly on 21 September. Erdogan did not say a word about Al-Assad during his whole 30-minute address. . . In the evening of 5 October, several hours after Baghdad’s forceful statement against Ankara, Russian President Vladimir Putin and his Turkish counterpart discussed the “issues of the Syrian crisis” on the phone, the Kremlin’s press service reported.